Britain’s Jewish community suffered its highest number of anti-Semitic incidents on record last year primarily due to the conflict in Gaza, a Jewish charity has said. Community Security Trust (CST), a Jewish organization which collects data on anti-Semitism, recorded 1,168 incidents last year, more than twice that of 2013. CST say the biggest increase in anti-Semitic incidents took place during July and August, the time of conflicts in Israel and Gaza, however even without this sharp rise 2014 would still have recorded an overall rise in incidents. The figures, which Home Secretary Theresa May described as “deeply concerning,” follow the publication of a survey last month which found 45 percent of Britons hold anti-Semitic views. CST, which has recorded anti-Semitic incidents in the UK since 1984, said there were 314 incidents in July and 228 incidents in August last year. Combined, these two months alone surpass the 535 incidents recorded in 2013. The group says this spike in anti-Semitism was caused by reactions to the conflict in Gaza, which claimed the lives of 2,131 Palestinians and 71 Israelis, according to the UN. Of the 1,168 total recorded incidents, 81 were violent assaults, one of which was classified as “extreme violence,” meaning it involved potential grievous bodily harm. In the same a month, a rabbi driving through London heard a man shout “slaughter the Jews” in Arabic at him, while running his finger across his throat in a cutting motion. In the most extreme incident of anti-Semitism last year, the victim was called a “Jewish c**t” before being hit with a glass and a baseball bat. British cases of anti-Semitism in January drew widespread national attention following the attack on a kosher supermarket in Paris last month. 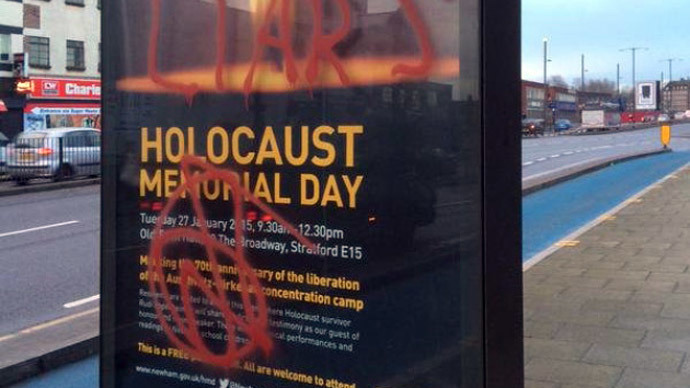 Vandals spraying the word “Liars” on Holocaust Memorial Day posters in Newport, London, while in Liverpool, two crudely drawn swastikas were etched into the door of a Jewish prayer hall. CST’s analysis follows the widely reported publication of a survey by Campaign Against Anti-Semitism (CAA) last month, which found 45 percent of Britons hold anti-Semitic views. CAA asked 3,411 adults in the UK a variety of questions to gauge their attitudes toward British Jews. They found one in four Britons believe Jews “chase money more than others,” while one in six feel Jews think they are superior to other people. However the findings were criticized by some, including Israeli-British journalist Anshel Pfeffer. “There is a real threat to life and limb, however, from a tiny number of jihadists and extreme Islamists,” he added.